Carbonara is a personal favorite of many girls, as it's easy to make and tastes like a slice of heaven; but as far as being a healthy meal goes, it kind of falls flat on its face. It's not the spaghetti that makes Carbonara such a poor dieting choice, although spaghetti itself is full of carbs, but the carbonara sauce that makes the dish. Cheese is one of the main components of carbonara, and we're talking high fat hard cheese. Bacon is another vital part of this dish that is also pretty high up on fats and low in nutritional value. You can avoid some of the carbs by going for a spaghetti brand made of soy or rice, and by using some of the lower fat cheeses or cheese replacements, but you will lose out on the taste of the meal, which is why carbonara is such a popular meal of choice. 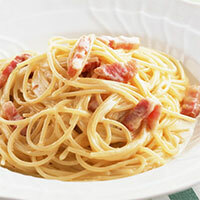 The calories in Carbonara per 369.1g(1 plate) is 779 calories. Carbonara is calculated to be 211Cal per 100 grams making 80Cal equivalent to 37.91g with 72.38g of mostly carbohydrates、39.35g of fat、26.61g of protein in 369.1g while being rich in vitamins and minerals such as Selenium and Molybdenum.